This is a translation of Gaelle Dobignard’s article “Comment savoir si les oeufs en cours d’incubation contiennent un poussin ?”. She’s the one expressing herself in this article. One of the most frequently asked questions is : How do I know for sure if the eggs I placed in the incubator or under a broody hen are actually fertilized and likely to hatch ? A simple solution : the egg candler ! We use a homemade candler built by JF which perfectly fits our needs. 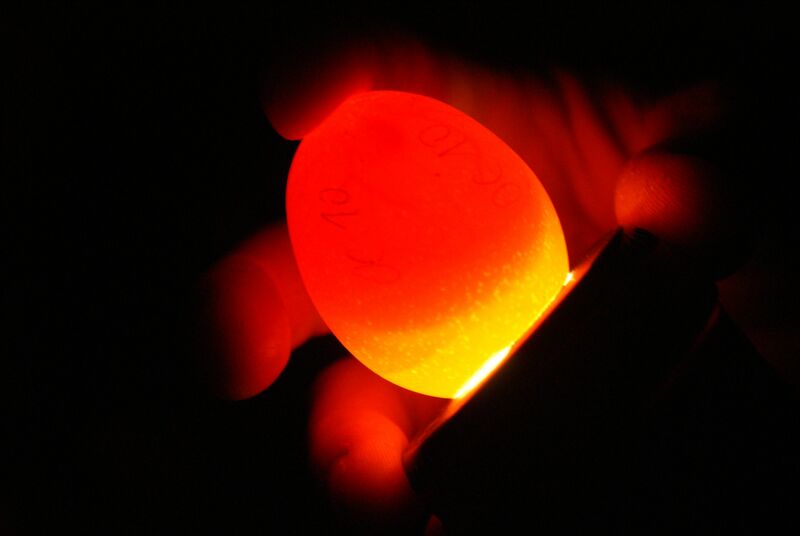 Candling an egg allows you to know if it is fertilized and how far along it is in the incubation process. The first reliable candling can be done from days 5 to 7, in order to check, without a doubt, if the embryo is developing correctly. Unfertilized or non developing eggs must be removed from the incubator, there is no point in leaving them inside. The picture at the vey top of the article shows an unfertilized egg. What should you expect to see on day 6 ? A 14 to 15 day-old fertilized egg : The embryonic development is far more advanced. At this stage, the embryo is just a mobile black dot surrounded by tiny little blood vessels called ‘spider veins’. The video shows what you should be seeing after 6 days of incubation. Dark or spotted eggs will be much more challenging to candle. You must have the right equipment to candle your eggs. Bear in mind that some candlers will heat up during the process. The excessive heat can harm the embryo, leading to it’s death. How to candle an egg ? The lamp is placed on the largest side of the egg, where the air cell is. With experience, a few seconds will be enough to know for sure if the embryo has started it’s development. If you are a beginner, we highly recommend candling the eggs from days 7 to 9, it’s a much more reliable period. On this video you can see a black dot moving on it’s own ! It’s the embryo, futur chick if everything goes as planned. Surrounding it, red blood vessels can easily be seen.